Join Prim Perfect’s Cake Against Cancer 2014! Every September, the UK charity Macmillan Cancer Support holds the biggest coffee morning in the world – and this year, we’ll be holding our own event for the second time – and we want YOU to join in! Last year, we held a very special coffee morning at Prim Perfect, where we raised £85.00 (over US$100) through the sale of virtual cake – and we will be doing it again this year. But this year we are inviting people across the grid to join us by holding coffee mornings of their own – in their stores, cafes, and virtual homes. We will either supply cakes for you or you can donate your own – and get your friends to share their favourite recipes too! We’ll be holding an event – a party at the Prim Perfect offices. We’ll be posting more details about times closer to the event! Well, we thought our virtual cake was rather good value! We asked people to give us their favourite cake recipe, and put it inside a virtual cake. Then when someone bought the virtual cake, they received a real recipe – so they really had whole cakes, that they could make over and over again – and there were a lot of really delicious cakes to try! 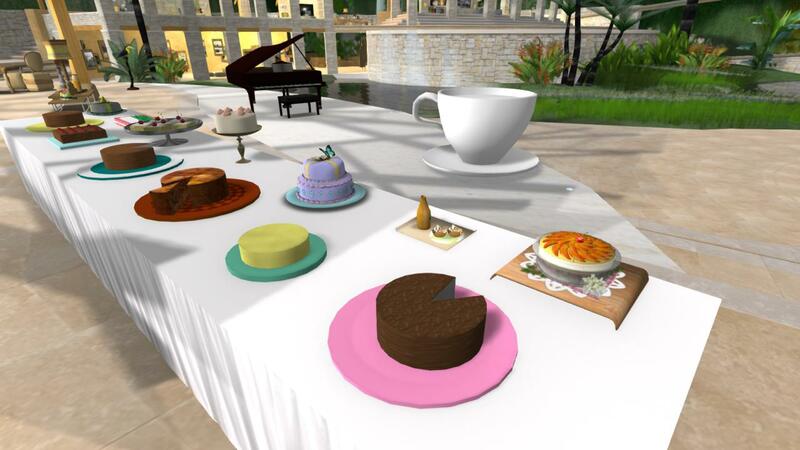 Some people made really exquisite Second Life cakes that you could take to display in your own kitchen. Others made simple cakes following our instructions, or even simply gave us a recipe and we made the cakes for them. So, you see, anyone can take part! 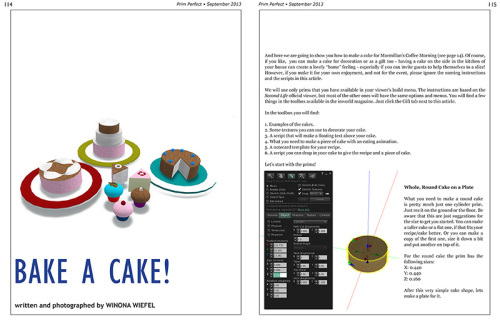 We’ll be printing instructions on how to make a simple Second Life cake in the new issue of Prim Perfect, and giving away tools to help you make a cake with the inworld copies of the magazine. On the grid, all the money we raise from cakes and donations will go to an avatar we have created especially for the event – Macmillan CoffeeMorning (with a registered name of CoffeeMorning Resident). But if you host your own event, you can donate to our Just Giving page. or directly to Macmillan Cancer Support. 2. You can make a cake, add your favourite recipe, and send it (full perms) to Macmillan CoffeeMorning (coffeemorning Resident), who will be putting them out on offer for the coffee morning. 3. Or you can send your recipe to Macmillan CoffeeMorning inworld or at primperfect@gmail.com – and we will bake a cake for you! 4. You can host your own coffee morning anywhere on the grid – and send the money to our Just Giving page. This money will be registered (so we can see how much we raise through the coffee mornings) and will be sent securely and directly to Macmillan Cancer Support. 5. Or you can simply make a donation through our Just Giving page, or directly to Macmillan Cancer Support. Previous Post: Calling all classic horror fans! Make sure you don’t miss the HP Lovecraft Festival! Pingback: Join Prim Perfect’s Cake Against Cancer 2014! (Post-86028) - [O.L.D.] Old London Docks - Best Second Life Blog Feeds!